I said these were addictive to knit, right? And in an aside you are totally not going to care about, they are so easy to pick up and put down. Their little project bag is wedged into the plastic tub in my coffee table cubby and there seems to be just enough ease that the yarn comes off the cake as I need it, without the cake popping out of place. So literally, I just sit down, reach for the needles, knit, and shove the needles back on top of the tub when I have to stop again. Usually I have to pick a bag up off the floor and put it back on the top of the table such that they will not fall off and roll under the sofa. I could easily knit two or three stitches in the time that takes. That adds up! this is not self-striping yarn. Seriously. When I wound it into cakes I freaked out because the colour changes are so fast: I knew this stuff would pool like nobody's business, and I'm... well, I'm just so... tough to find a word for this... Type A??? when it comes to pooling. In fact you can see from the cuff how much this is so. See all the pale yellow? on the back it's just green, with some red. 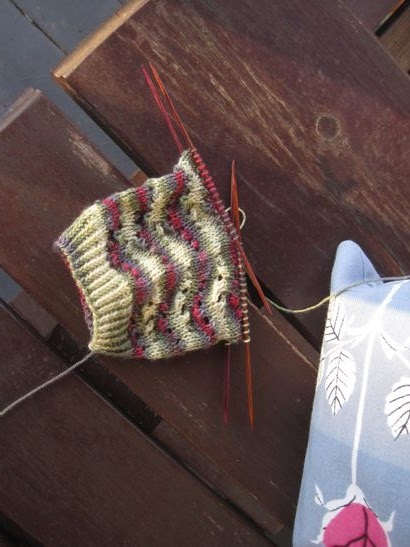 I had a leg up (ha) on this problem because I pored over my copy of Carol Sulcoski's Knitting Socks with Handpainted Yarn when I first got it. I knew that you could break up pooling with lots of increase and decreases and general shifting, and indeed the book itself is full of patterns categorized for different degrees of variegation. Fortunately I stumbled across a pretty awesome stitch that fit into the math for my standard sock and shuffles around the stitches while offering long periods of plain knitting so I can keep my speed up. No pooling, and now I'm getting stripes, and texture, and enough erratic movement of holes and bumps to make me think of the way a zombie lopes around looking for its next brain. Overall I'm quite pleased with myself and also pleased that I seem to be sick again, since it justifies popping the copy of the latest (though no longer recent) Jane Eyre movie my aunt loaned me into the DVD player and knitting for a couple of hours. 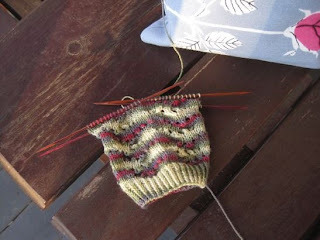 Since I took that picture I've gotten so close to the heel of the first sock I can nearly touch it. Have a lovely weekend all, see you Monday!